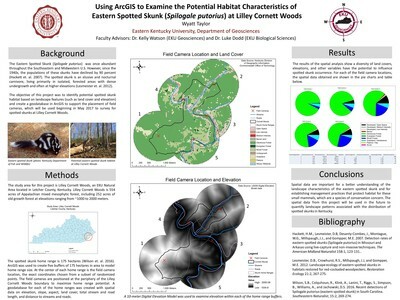 This project uses ArcGIS to identify potential habitat of the Eastern Spotted Skunk (Spilogale putoris) in Kentucky. Since the 1940s, the populations of these skunks have declined by 90 percent in their range across the Eastern United States. As a result, recent studies are attempting to better understand the habitat characteristics of this rare and reclusive species. I used ArcMap to build a geodatabase of potential Eastern Spotted Skunk habitat, as these skunks are known to live in isolated, forested areas with dense undergrowth and often at higher elevations. The results of this project will be used in future research using field cameras to confirm the presence of the skunks and to better understand the habitat characteristics most favorable for spotted skunks in Kentucky.